Now you can build our most popular design, Eight Ball, in the original conventional method or in the Stitch and Glue version, designated as EIGHT BALL-SG. The building methods vary, but the hull is vintage Eight Ball! The EIGHT BALL-SG features three watertight seat/compartments. Let the kids fill it full of water... it won't sink! 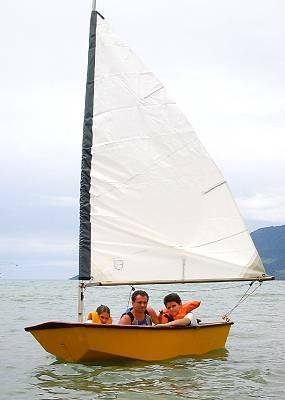 The sailing version utilizes a daggerboard that can be removed when not sailing. There's only so much we can say about Stitch and Glue before we start repeating ourselves... but if you have a minimum of tools... if you want the easiest construction method, then SG is for you. To further simplify construction, we offer various kits as noted below. Get started today--don't miss another day of sailing.